Previous articles have looked at the Bank of England’s bank rate. For a brief recap, the chart below plots the level of the bank rate since 1901. When growth in an economy is thought to be too low, interest rates may be reduced to increase consumption and investment. However, at a certain stage low interest rates may lead to inflation with over-investment in property and other assets. At this point, to limit inflation, interest rates may be raised. This cycle of interest rates increasing and decreasing is roughly related to the economic cycle: low growth leads to lower interest rates, and high growth leads to higher interest rates. When central banks are lowering interest rates this is often referred to as the easing phase of the interest rate cycle; when rates are being raised this is the tightening phase of the cycle. For the purposes of the study here, rates are said to be in an easing phase if the previous rate change was down. They stay in this phase until a positive rate change occurs, at which point rates move into a tightening phase. The following chart reproduces the first chart but overlays vertical bars to highlight the tightening phase of the interest rate cycle (i.e. periods when the bank rate is being increased). The periods without grey bars are therefore easing phases. The following table gives a summary of the length of time the base rate stayed in the respective phases. Over the whole period rates stayed in an easing phase (68%) for twice as long as they did in a tightening phase (32%). The following chart is similar to the above, but zooms into the shorter time period: 1970-2016. It can be seen that before 1988 monetary policy changed direction frequently (i.e. the average interest rate cycle was short). 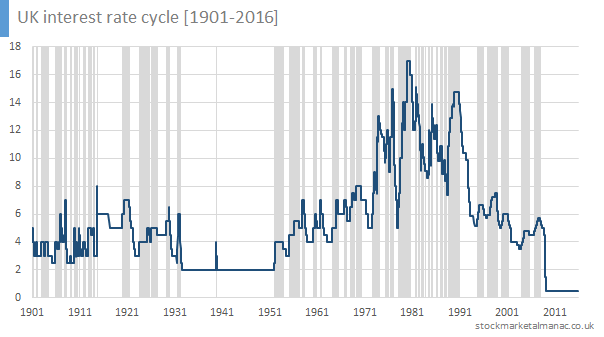 After 1988, monetary policy settled down and the interest rate cycle became much longer. 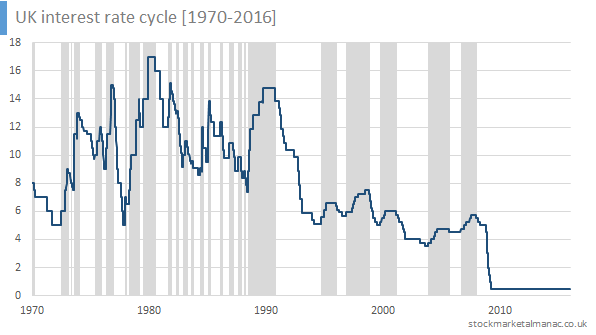 For example, in the five years, 1983-1988, there were seven full rate cycles (i.e. an easing phase followed by a tightening phase), the same number as occurred in the 28 years since 1988. 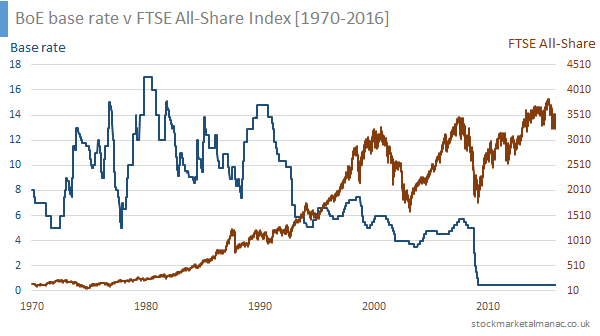 For reference, the following chart overlays the FTSE All-Share Index on the BoE base rate. It can be seen that the period of great credit expansion that occurred 1980-2000 was accompanied by an overall decline in interest rates from 17% to 5%. 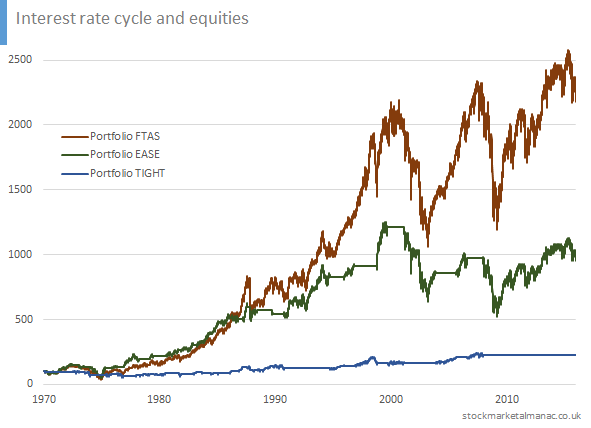 The following chart (crudely) shows what happened to equities over this period during the discrete periods of interest rates being eased and tightened. The green line plots the value of a portfolio that invested in the equity market only during the easing phase of interest rates. The blue line plots the value of a portfolio that invested in the equity market only during the tightening phase of interest rates. The red line plots a simple buy-and-hold market portfolio. All portfolio values start at 100. By 2016 the Easing Portfolio had a value of 986, while the Tightening Portfolio a value of 228. Obviously some of this difference in performance is attributable to the fact that the Easing Portfolio was invested in the market for twice as long as the Tightening Portfolio. 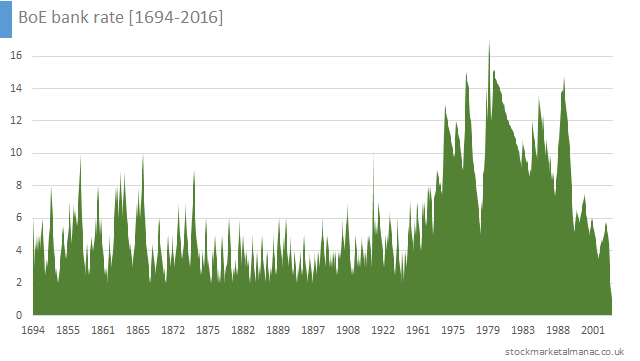 A previous article looked at the history of the official bank rate since 1694. Here we will analyse all the discrete changes made to the bank rate since 1694. Since 1694 the Bank of England has made 828 changes to the bank rate. Changes to the bank rate today are recommended by the Monetary Policy Committee (MPC), which meets once a month to consider changes to the bank rate (more info on the MPC). As can be seen, until the beginning of the 20th century the great majority of rate changes were +/- 0.5 and +/- 1. And also the balance of the size of positive and negative rate changes was roughly equal. Towards the end of the 20th century the Bank started experimenting with larger and smaller increments of change. And the balance of rate changes also changed: periods of small negative changes would be interrupted by larger positive rate adjustments. In 1982 the Bank began a cautious period of frequent rate reductions of just 0.125 (the smallest rate reduction up to this time). The last time the bank rate was reduced by such a small amount was in 1989. The frequency distribution of size of rate changes is shown in the following chart. As can be seen, the most common rate change has been a reduction of half a percentage point. 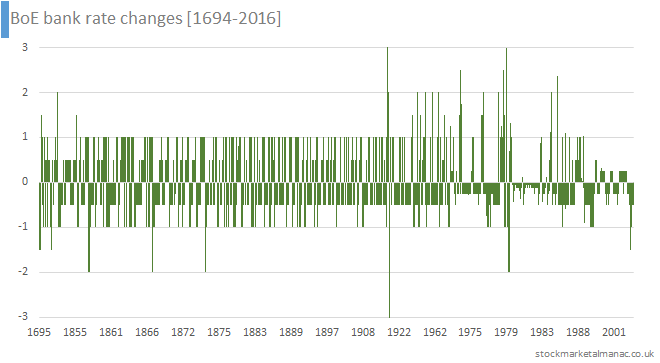 (Since 1694 33% of all rate changes have been for -0.5.) After that the most frequent rate change was plus one percentage point. The above chart supports the (well-known) observation that rates are reduced cautiously with small increments and increased with more aggressive, larger increments. The following chart breaks this frequency distribution down by century. 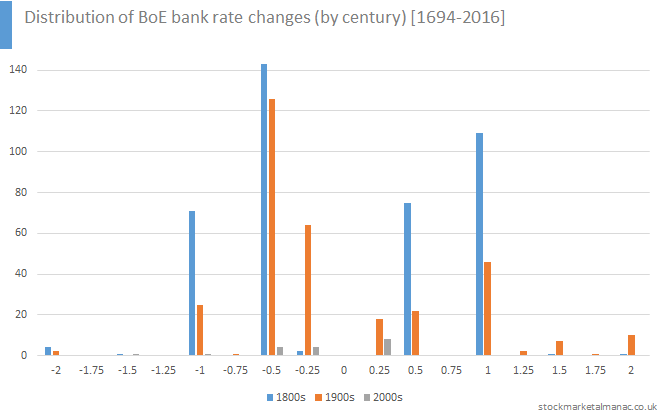 The above chart supports the previous observation that, whereas in the 19th century the Bank restricted its changes to a narrow band of increments, in the 20th century the size of the rate changes were more dispersed. There are many different interest rates in the UK but one of the most important is the official bank rate (sometimes also referred to as the Bank of England base rate). This is the rate at which the Bank of England lends to banks. It has a direct influence on interest rates in the domestic banking system and as such the bank rate is a reference level for the rates which the London clearing banks pay on deposits and charge on loans. Changes to the bank rate are recommended by the Monetary Policy Committee (MPC), which meets once a month to consider changes to the bank rate (more info on the MPC). Further information on the official bank rate can be found here at the BoE web site. 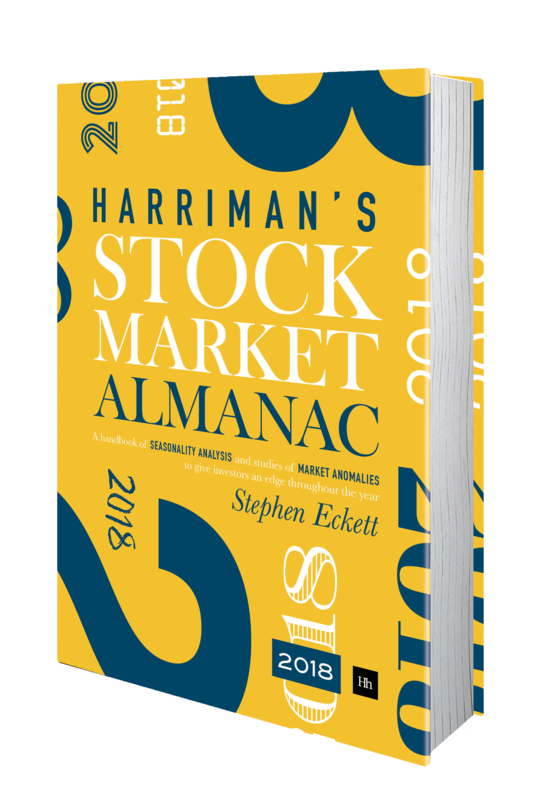 Over the years this interest rate has been referred to variously as the Bank Rate, Minimum Lending Rate, Minimum Band 1 Dealing Rate, Repo Rate and, today, the Official Bank Rate. But we can regard them all as essentially the same thing. 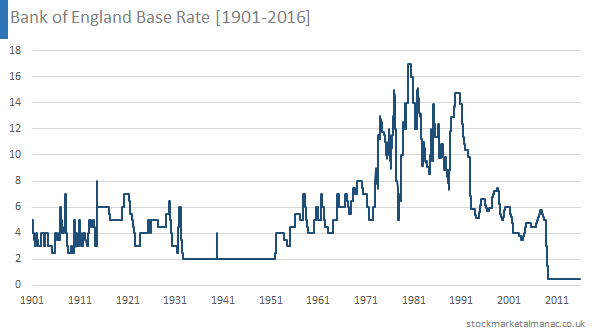 And we can concatenate these rates over the years to create a continuous record of base rates from 1694. For reference the rates for different periods are shown in the following table. The following table gives some statistics by century on this bank rate data from 1694. The Count row gives the number of times the bank rate was changed in each respective century. 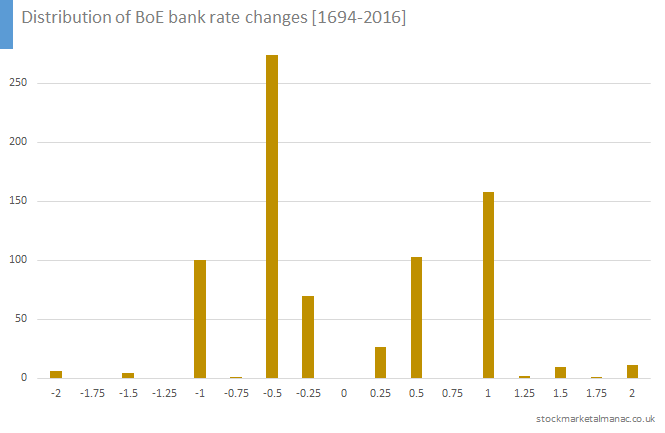 Until 1973 the average bank rate had been around 4%, but then shot up to levels not seen before – reaching a maximum of 17% in 1980. Volatility (measured by standard deviation) of the bank rate also increased at the same time to levels not seen before. The bank rate we have today, 0.5%, can be clearly seen to be unprecedented. Previously, the lowest rates seen had been 2% in the 18th and 19th centuries.